Clam Cancer Spreads Along Eastern Seaboard : Shots - Health News Renegade cells floating through seawater apparently cause the cancer, scientists say. Though people can't catch it, the malignancy might offer clues to how cancer cells spread in the human body. 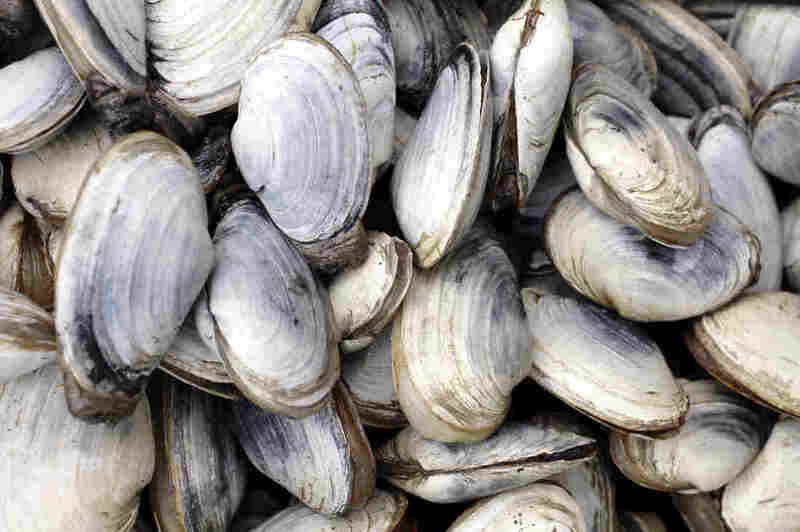 The blood cancer in soft-shell clams poses no risk to humans, but it does kill the shellfish. Not every clam is, as the expression goes, happy as a clam. Even shellfish, it turns out, can get cancer. And it just might be that this cancer is spread from clam to clam by rogue cells bobbing through the ocean, scientists reported Thursday in the journal Cell. You might be surprised to hear that clams can get blood cancer. "But the fact is they have a circulatory system, and they can get leukemia," says Stephen Goff, a Howard Hughes Medical Institute investigator at Columbia University. The leukemia kills the clams, but Goff says it poses no risk to people who eat clams, like the soft-shell clams that are harvested along the Eastern Seaboard. "I love them," he says. "They're what you get as fried clams and steamers." 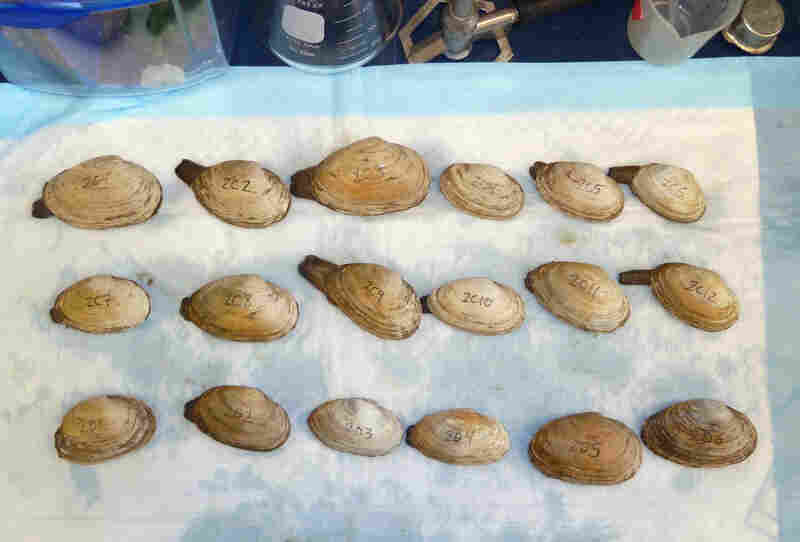 Scientists look for clam leukemia cells in shellfish bought at a market in New York. But Goff's relationship with clams has just changed dramatically. He usually studies viruses that cause cancer in mice. Recently he was contacted by Carol Reinisch, a biologist at the Marine Biology Laboratory in Woods Hole, Mass. She studies leukemia in soft-shell clams, and she asked Goff to look for signs of a cancer-causing virus in these clams. He didn't find a virus, but what he found instead was a shock. Each of the cancer cells he looked at, in clams from New York to Prince Edward Island, Canada, had a similar genetic fingerprint. That strongly suggests the cancer is spread when these cells replicate and spread through the water, he says. "We know the cells can survive in seawater quite long," Goff says. "And we can only guess that they would be picked up somehow by another healthy clam." This could be because clams feed by filtering enormous volumes of seawater. They might simply siphon up these free-floating cancer cells and literally catch cancer. There are only two other cancers known to spread by cells, like this. One is devastating populations of Tasmanian devils, meat-eating marsupials in Australia. Another is spread sexually in dogs. Goff thinks this might be the third example. "It's very clear that something unusual is going on here," says Michael Lesser, a marine biologist at the University of New Hampshire. But he says this isn't an open-and-shut case. Nobody has yet done the critical lab experiment to show that this cell-based transmission actually occurs. He wants firsthand evidence that a clam, by eating a cancer cell, can actually contract the disease. Scientists who study these clams are eager to get going on these experiments, Lesser says, to see whether they can prove this transmission is actually happening. However this turns out, Goff says, surprises like this can really move science forward. "I'm a big fan of the idea that when something really intriguing comes along, it's great to follow your lead and see where it's going to take you," he says. This opens up a host of questions about how diseases might spread through the marine environment. And it might have implications for human health as well. "Learning how these cells are evolving, learning how they manage to spread will be very interesting," Goff says. "I think it could inform our understanding of how metastasis occurs."